Mindfulness/awareness meditation is the foundation of all that we do at the Shambhala Meditation Centre. This ancient practice of self-discovery is rooted in the simple but revolutionary premise that every human being has the ability to cultivate the mind’s inherent stability, clarity and strength in order to be more awake and to develop the compassion and insight necessary to care for oneself and the world genuinely. To read more or watch a video teaching or take an on-line course, visit the meditation page at Shambhala.org. Every Tuesday and Wednesday evening at 7 pm, and each Thursday morning at 10 am, the Shambhala Meditation Centre offers meditation instruction, group meditation practice, and regular public talks. Wear loose, comfortable clothing. Meditation cushions are provided. No experience necessary! Everyone is welcome. Preregistration is not required. We also offer individual meditation instruction upon request. See details below. 7 pm – Meditation instruction provided upon request. 7 pm – Group meditation practice in main meditation room. 8 pm – Tea and cookies. 8:15 pm –Evening classes and talks, as scheduled. 10 am to 11 am –Sitting and walking meditation. 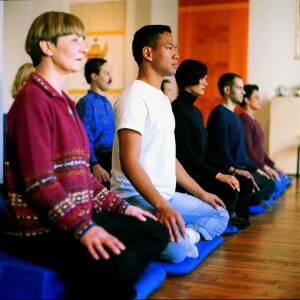 10:00 am to 11 am –Meditation instruction for newcomers. 11 am to 11:15 am – Tea. Once per month: Three-hour introductory session. 10 am to 1 pm. Usually the first Saturday of each month (but check the calendar). This three-hour program introduces beginners and those wanting a refresher to the practice of meditation. The program includes meditation instruction with a qualified instructor, short practice sessions, talks, and discussion. By donation. You can also receive an in-depth introduction to meditation through the Way of Shambhala path of training. Individual, one-on-one meditation instruction is also available for those wishing to learn and practice the basics of meditation. Our trained meditation guides will provide you with all the information and structure you need to begin your meditation practice. Please email us at guidestoronto@gmail.com and we will contact you via email to set up a time and date for your meditation instruction session at the Toronto Shambhala Centre. Free of charge. Not just for new meditators, instruction is also recommended as part of one’s ongoing practice. You are always welcome to speak to an instructor about your practice. You may also ask to form an ongoing working relationship with the instructor of your choice.